Mangaluru, June 10, 2016: As per information from Konkan Rail, the schedule of trains running on the Konkan rail route will change on June 10, today, Friday and continue to be in effect till October 31 as Konkan Railway Corporation Ltd. is enforcing the monsoon timetable. Trains will run at reduced speeds on the Konkan network that passes through hilly terrain to avoid any possible untoward incident during torrential rain. The new timetable will be applicable to trains starting on June 10, from their originating stations. The schedule of two trains, Train No 12620 and Train No 12617, have been advanced during the period. Train No. 12620 Mangaluru Central-Lokamanya Tilak Terminus Matsyagandha Express will leave Mangaluru Central at 12.50 p.m. instead of the original 2.35 p.m. Similarly, Train No. 12617 Ernakulam Junction-Nizamuddin Mangala Lakshadweep Express will leave Ernakulam at 10.45 a.m. and Mangaluru Junction at 7.30 p.m. (original departure time at Mangaluru Junction was 9.45 p.m.), according to a release from Southern Railway. Train No. 12133 Mumbai CST-Mangaluru Junction Express will arrive at Mangaluru Junction at 3.15 p.m. instead of 12.40 p.m. and its pairing train, Train No. 12134 will leave at 4.45 p.m. instead of 1.55 p.m. 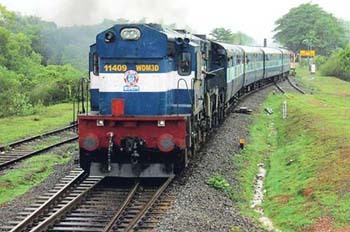 The special time table during monsoon is must of Konkan Railway . Its very risky. The time differ for reaching the destination.